Are you tired of boiling water with a kettle? Do you find it time-consuming, especially if you only want one cup of coffee? The answer to your problem could be the hot water dispenser. Sleeker and aesthetically pleasing than the traditional kettle, the hot water dispenser conveniently provides you with hot water instantly. You have the ability to choose from various heat settings to suit all your hot drink needs, and quite often there is the bonus of an included filtration system. 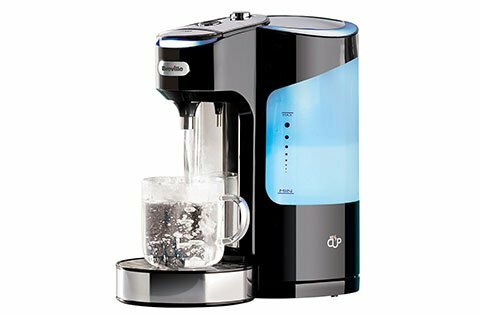 If you are looking to buy the best hot water dispenser, then this article will help you. With all the hard work and research completed for you, all you have to do is get the tea and coffee ready! 4 Which one is The Best Hot Water Dispenser? When buying any new kitchen item, there are some factors you need to consider, and a hot water dispenser is no different. We will outline three key factors to keep in mind before purchasing your hot water dispenser. The tank size will vary from dispenser to dispenser, and it is important to consider your needs. For small, single cups a 1.5-litre tank should be sufficient. If you have a larger family or would like to use you hot water dispenser for cooking or cleaning purposes, you need to consider a much larger sized tank. The amount of water that can be dispensed at once is also a consideration. Some hot water dispensers have set amounts whilst others offer a manual function to give you complete control and provide you with any amount you like. A hot water dispenser often allows you to choose from a number of heat settings. This is particularly useful if you are drinking herbal tea as they taste better when steeped at specific temperatures. If you don’t add milk to your hot beverage, you won’t have to wait for it to cool to a reasonable drinking temperature if you make use of the temperature settings. For some, being able to control the temperature may seem extravagant, but is definitely a consideration for herbal and milk-free tea and coffee drinkers! The higher the wattage, generally the faster your water will heat. Some hot water dispensers will produce boiling water in five seconds, and others can take up to 45 seconds. It depends on how quickly you want your hot water as to whether you purchase one with a higher wattage. Energy efficiency impacts not only the environment but also your finances. The more economical and efficient a device is the lower your electricity bill. If you have a small family, or only use hot water sporadically, a larger sized tank will waste money and energy. Opt for something that is within your needs to save energy. Boiling water will help to eliminate harmful chemicals, but a hot water dispenser with a built-in filter will guarantee the highest quality water. If you are susceptible to tasting impurities in the water and don’t want it to affect your drink, seek out a hot water dispenser that includes a water filter. A loud, whirring noise and beeping buttons can be distracting to your co-workers or disturb your family (especially for that early morning coffee). Whilst a soundless hot water dispenser may be nigh-on impossible, a quiet one will be more suitable for smaller environments. There’s no point spending money on a device that you never use because it is just too technical! When it comes to hot water dispensers easy is best. Make sure you can remove the tank and refill it and that you understand what all the buttons mean. A variety of settings are great, but sometimes a simple ‘one-touch’ button is all you need. Look for a dispenser that has a manual stop button, so you can precisely control how much water you are dispensing. Make sure your hot water dispenser has a drip tray to catch any spills and mess. It’s also worth checking that this tray can be removed and cleaned thoroughly for hygiene purposes. This Andrew James hot water dispenser is one of the most stylish on the market. The LED display and smooth touch buttons allow you to select your desired temperature of water from five pre-set temperatures (55°C / 65°C / 75°C / 85°C / 100°C). This is great if you are drinking herbal tea where the ideal steeping temperature varies. This also allows you to drink your beverage immediately without waiting for it to cool down. There is also variability in the volume of water that can be dispensed at any given time. The three settings are perfect for a small cup, a large cup, or enough to make a noodle pot for lunch! The Andrew James dispenser holds four litres, far more than similar products on the market, making it a little more appropriate for larger groups. It is also far superior to others regarding heat up time, taking only 5 seconds. There is also the added feature of water filtration, with the option of dispensing filtered, unheated water. Priced very reasonably, the Andrew James hot water dispenser offers a large range of useful functions, making your old kettle practically an antique and rendering it useless! By using this hot water dispenser you are saving time and money, and your kitchen countertops will look good while you are doing it! Another sleek and innovative design from Breville. The VKJ318 has a two litre capacity with a large window so you can always see how much water is left. The amount of water dispensed at any given time is variable. You can fill your cup manually or choose from one of the nine cup size settings. It takes longer than many of its competitors to boil a single cup, but you will be too distracted by the sophisticated blue glow for it to bother you too much. The whole contraption can be easily pulled apart for refilling and cleaning, making it very user-friendly and hygienic. If you are looking for a hot water dispenser that will cater for larger groups, you might need to keep looking as the two-litre capacity won’t get you very far in terms of a large number of hot drinks. The price is mid-range, but with a variety of settings and an elegant appearance, it may worth those extra pennies. 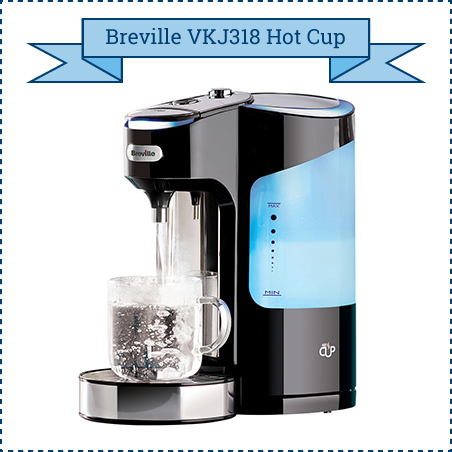 This Breville VKJ367 Hot water dispenser has a futuristic look about it. The water tank will hold 1.8 litres and contains a Brita filter to ensure you are getting the best water possible. Whilst the tank size is smaller than many other hot water dispensers, the Breville VKJ367 makes up for this by offering nine different cup sizes for you to choose from. This allows you to use the exact amount of water for a small tea, a large coffee, or noodles. There is also a manual ‘stop’ button to prevent any overflow and this button also acts as a safety feature to minimise burns and scalds. When you activate the Breville VKJ367 Hot water dispenser, a soft blue glow will fill the room, adding a touch of modern style to your kitchen. 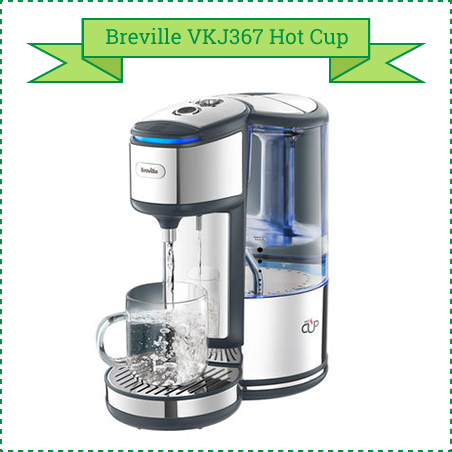 Keeping in mind that you are receiving a 2-in-1 filtration system and hot water dispenser, the Breville VKJ367 is excellent value for money. It won’t really suffice for large groups, but will definitely add a nice touch to your kitchen or office. 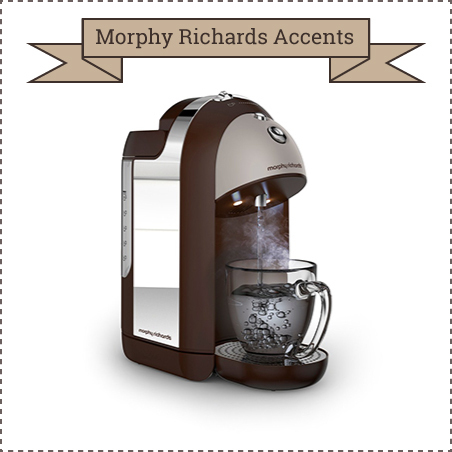 Morphy Richards have created a sleek hot water dispenser more likened to a piece of art than a kitchen appliance. It will take 45 seconds to heat your water, and the tank can hold up to 1.8 litres, making refilling a fairly infrequent chore, although this is still less than some of its competitors. 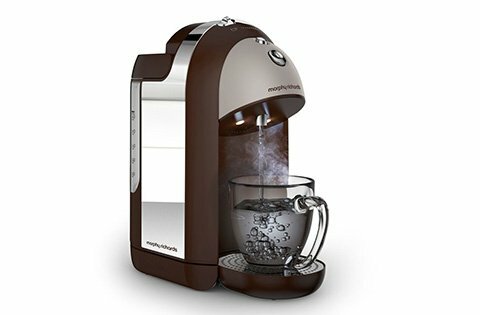 The Morphy Richards 130001 has a handy ‘stop’ button to help prevent overflow mess if you are only filling a small cup, but the drip tray will also catch any spills to eliminate unwanted mess. Covered by a two-year warranty, you are filled with confidence from the manufacturer that the product is of a high standard. Unfortunately, like many other hot water dispensers, catering for large groups is more time consuming that a standard kettle. However, for that quick cuppa, it is perfect. The Morphy Richards 130001 is a cost effective way to boil small amounts of water quickly, and it looks far more stylish than your old kettle! The unique red colour sets this hot water dispenser apart from its competitors. It looks far more traditional and does a superb job at boiling water in a matter of seconds. The 2.5-litre tank holds enough water for around ten cups, and the markings on the tank are easy to read to ensure that you notice when the tank is running low, therefore needing a refill. You are always in complete control when using the VonShef dispenser, simply switch the button to the ‘on’ position to start the flow. When you have dispensed the amount of water you require, just turn the button back to the ‘off’ position and flow will stop immediately. This eliminates water wastage and makes it a useful appliance for a wide range of fussy users! If you happen to spill a few drops, the drip tray will catch any mess, so you won’t need to mop up a puddle of water from your kitchen countertop. 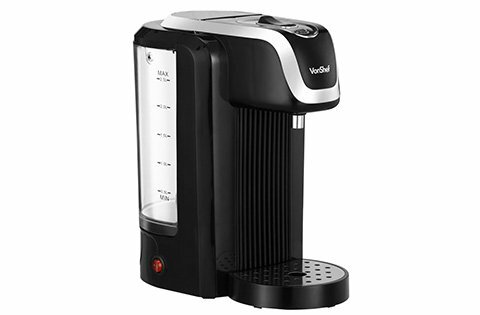 The VonShef hot water dispenser is lower priced than many of its competitors and holds more water than a lot of other dispensers. This makes it terrific value for money and the two-year warranty should give you a good peace of mind. This Breville design boils water in an elegant fashion while adding style to your countertop. Designed to be able to boil five cups of water eliminates the need for frequent refilling. You only boil what you need. Simply press a button to activate the boiling process, and a cup of hot water will ready in a matter of seconds, no more waiting for what feels like an eternity for the kettle to boil. 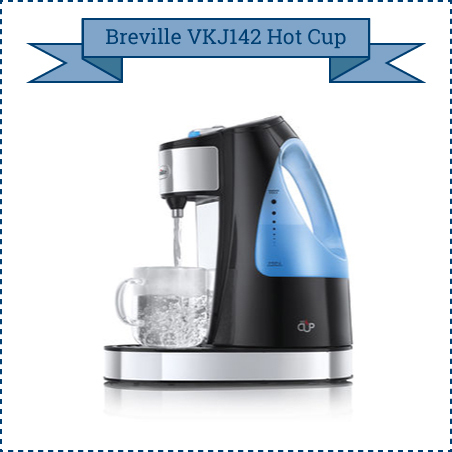 By boiling only what you need, the Breville VKJ142 is a more efficient and energy saving than your kettle. Mess is virtually non-existent courtesy of the drip tray. The drip tray catches any spills and can be easily removed for emptying and cleaning. It is perfect for offices and times when you only need a small amount of water at a time. Large group catering is tricky with this dispenser as you can only make five cups at a time before needing to refill the dispenser. 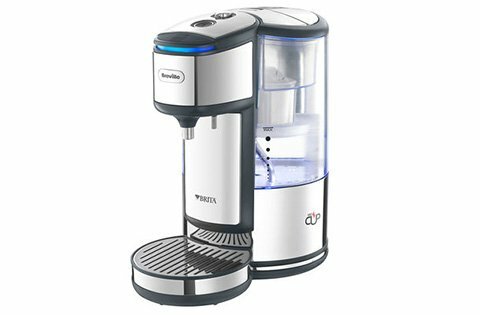 The Breville VKJ142 is on the lower end of the price range when it comes to hot water dispensers found on the market today. 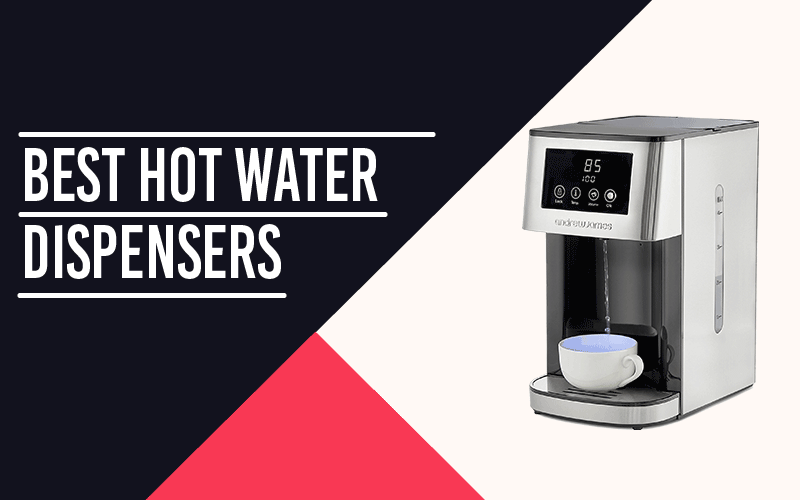 If you are after a cheap device to provide you with instant, individual cups of hot water, then this is the best hot water dispenser for you. 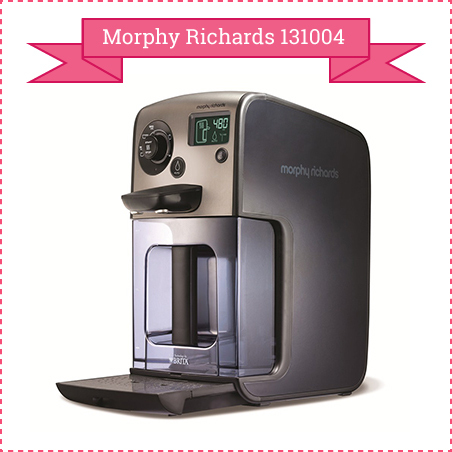 Use less energy and only use the amount of water you need with the Morphy Richards 131004 hot water dispenser. The built-in Brita filtration technology eliminates unwanted substances such as chlorine and limescale, providing you with the best water possible. Unlike many other hot water dispensers, the Morphy Richards 131004 dispenser can deliver enough water to cook a pot of pasta. A variety of temperature settings allows you to choose the perfect temperature for your needs; many herbal teas taste better when the water heats up to around 85 degrees Celsius. The three-litre capacity is around double that of an ordinary kettle, making it far more cost effective. A digital display clearly indicates the temperature setting and the desired amount of water to dispense. 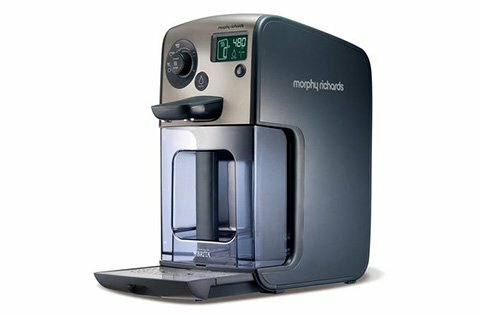 The Morphy Richards 131004 is more superior is design and function than many of its competitors, but it is also more expensive. The extra cost is not necessarily reflective of its quality, but if you have a larger budget, it is one of the best hot water dispensers. 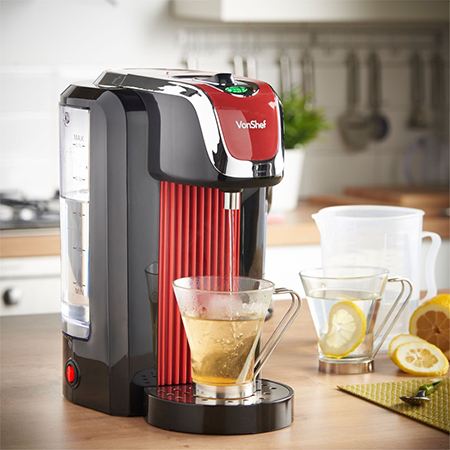 Introducing…Redefine Hot Water Dispenser from Morphy Richards on Vimeo. 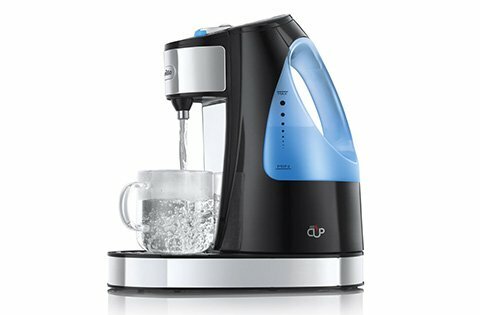 Which one is The Best Hot Water Dispenser? When it comes to the perfect combination of style, function and price, you can’t beat the Andrew James Hot Water Dispenser. A number of heat settings and cup sizes can be selected with the touch of a button, and it has the added bonus of a water filter. In fact, you can choose to dispense cold, filtered water making the Andrew James Hot Water Dispenser a 2-in-1 device. It priced well below many similar products that offer the same functions, so it is ideal for anyone on a smaller budget, or just looking to save a few quid. Overall, a hot water dispenser is able to provide hot water at a much faster rate than a kettle. 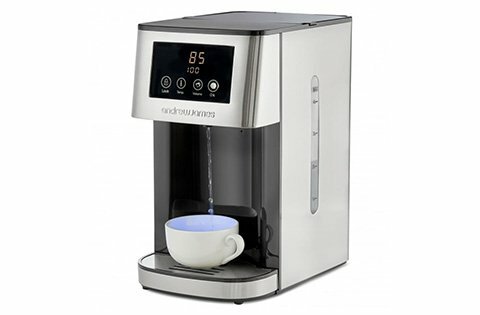 The instant hot water makes preparing hot drinks a breeze and with the ability to choose from different heat settings, a hot water dispenser will prepare a variety of drinks at just the right temperature. Filtration systems are often included to ensure the purity of the water, and they can be a much safer option for heating water around children, reducing the risk of burns and scalds. Hopefully, our list of the best hot water dispensers will help you make an informed decision regarding the purchase of your very own hot water dispenser. Do away with your old kettle and have hot water available at your fingertips with a simple touch of a button. This a very interesting review but having owned two of these machines have some reservations. 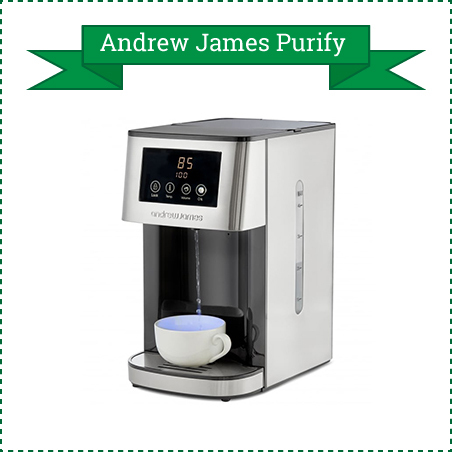 The Andrew James is good value for money but the water bounces out of the cup which is quite worrying and consequently you have to keep on top of the kitchen surfaces as it can leave coffee blobs which could stain the work surface. The Morphy Richards double spout is great for two cups at once but we found descaling and occasional crashing of the technology quite annoying. That said we are now replacing the Andrew James with our second Morphy Richards and will descale regularly this time but agree with the review that price may be the determining factor for most people. The Morphy Richards looks like it is being discontinued so can be bought cheaper than it’s original price which has influenced our decision to re buy.